Tradition und Brauchtum statt Gewalt! Diesen Juli hat in einem kleinen Dorf in Niederösterreich etwas Ungewöhnliches stattgefunden: 32 Jugendliche aus Österreich, Ungarn, Israel und Palästina haben sich gemeinsam mit 16 Erwachsenen, darunter Psychologen, Gruppenkoordinatoren und Künstlern zusammengefunden, um über Frieden und Konflikte zu diskutieren. Nicht nur diese oft emotionalen und spannungsgeladenen Diskussionen (die Large Groups) fanden dort statt, auch Kulturabende jeder Nation, Rhythmus- und Kunstworkshops sowie Anstöße zum Erforschen der eigenen Identität gab es. Dieses Projekt wurde 2004von der jüdisch-österreichischen Psychotherapeutin Evelyn Böhmer-Laufer und ihrem Mann ins Leben gerufen und fand nun zum 11. Mal statt. Im Folgenden berichte ich als Teilnehmerin über meine Erfahrungen im Peacecamp. 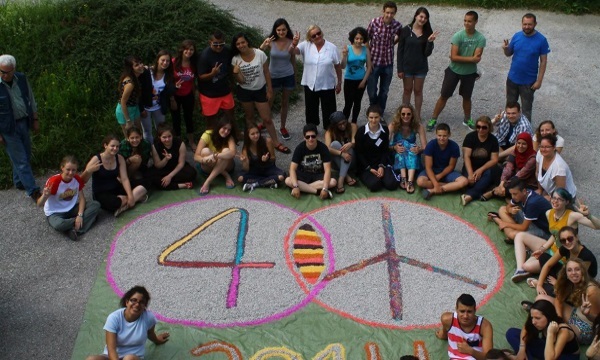 Something extraordinary happened this July in a small village in Lower Austria: 32 teenagers from Austria, Hungary, Israel and Palestine came together with 16 adult psychologists, coordinators and artists to discuss matters of peace and conflict. Not only these often emotional discussions (the Large Groups) took place, there were also Culture Evenings to represent each nation, rhythm and art workshops, as well as self-exploration sessions to define one’s identity. This project was called to life in 2004 by the Jewish Austrian psychotherapist Evelyn Böhmer-Laufer and her husband and took place for the 11th time now. 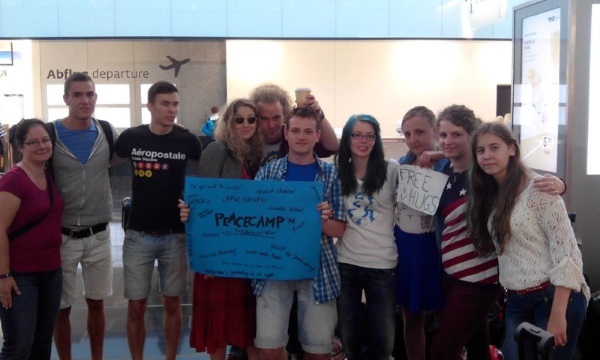 The following is an account of my experiences as a participant of Peacecamp. When I signed up for Peacecamp this spring, I really didn’t know what to expect. I had no idea what kind of activities were planned, what kinds of people I was going to meet, or what we were going to discuss in the Large Group. To be honest, I was kind of skeptical at first! Well, it turned out to be an experience that deeply changed me and my worldview and something I am extremely grateful to have been part of. When we met each other at the airport, the 31 strangers from Israel, Palestine, Hungary and Austria were just many faces and names I couldn’t pronounce…but very soon we started talking to each other, had a lot of fun and bonded as a group (and I think we grew very close in those 10 days!). Especially the Culture Evenings and the Talent Show, and the big show in Vienna made me really happy and I was very impressed by all the cool dances the other delegations performed! But naturally, we didn’t only have fun there…after all, we came to discuss important and difficult matters…this happened in the Large Group, which were mostly really interesting to listen to, but there were also many things that shattered me to my roots. So I had a hard time with these things, but it was vital that they have been voiced! However, I didn’t only learn about new cultures, conflicts and problems in other countries, but also much about myself. On the one hand, the activities made me act more open towards others and more focused on what’s happening to the people around me, but on the other hand I also found out many things about my own identity, which was (and is) extremely important at this time in my life. Also, for the team: I know how hard it is to work with a large group of teenagers with that many different points of view and motivate them to get up, WALK, stand up for their opinions and sometimes to embarrass themselves…thank you for doing that, you did a great job! What I take with me from Peacecamp are not only lots of new awesome songs, language skills, cool dances, many good friends, but also an expanded mindset. And lots of beautiful, intimate, fun, awkward, hurtful and valuable moments. 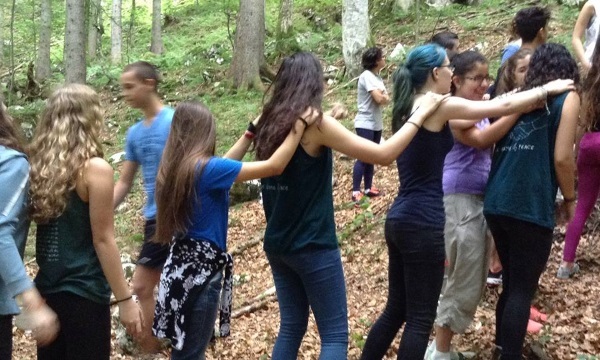 Peacecamp showed me that people’s thoughts, worldviews and thus behaviours and actions can be changed by simple (yes, sometimes difficult) tasks like discussions, group-bonding activities and generally more thinking about a specific topic. So I know that it has the potential to change more people, and I definitely want more people to change in that direction towards more understanding, tolerance, eventually some kind of peace.